The railway connection between Middlesbrough and Whitby along the Cleveland coast has long since been abandoned. It is, perhaps, a project which should have never left the drawing board if the truth be known. Victorian verve and ambition took the thin black line winding around natural obstacles and, at times, perilously close to the sea – but it can now only be traced as far south as the Boulby Potash Mines. The remainder to the east and south was dismantled around 1960 and given over to a coastal footpath. The easternmost stretch of the surviving line, from Skinningrove to Boulby, was closed, too, at this time, but was revived in the mid 1970s when Boulby Potash mine opened. It is used solely for freight, the passenger stations remaining closed (many having been demolished). One such stopping-off point was Grinkle Station, to the south-west of present-day Easington where the tracks emerge from Grinkle Tunnel. Track and tunnel alike first saw light of day in the early 1880s after almost two decades of confused planning and awkward construction. Originally known as Easington Station and Tunnel, they were renamed ‘Grinkle’ in 1904. The station was the first on the line to be closed in 1939, the line was lifted in the early 1960s … then relaid a decade later in 1974 to enable minerals to be transported from Boulby Mine to Skinningrove and onwards. It is still in use today. More info and pics available here. Boulby is home to the second deepest mine in Europe – its 1,400m (4,600ft) depths being a mere 40-odd metres short of those of the Pyhäsalmi Mine in Finland. Construction began there in 1969, and it began giving up its treasure – potash – in 1973. It supplies more than half of the UK’s requirements of the stuff (which is used in agricultural fertiliser), with rock salt being harvested, too, as a by-product. The mine is, however, perhaps more famously known for its underground laboratory. Due entirely to the depth of its workings, boffins run two very expensive-sounding items of equipment near the foot of the mine, namely, the ZEPLIN-III and DRIFT-II dark matter detectors. If you’re expecting a layman’s explanation of the nature and importance of this strange-sounding and invisible material, then I’m sorry to disappoint. Try Wikipedia or the BBCwebsite instead – where, at the latter, you will find a TV report from Boulby. But it’s clearly important work. And this remote outpost on the Cleveland coast is pretty privileged to be host to such a barrage of expensive equipment – for the DRIFT-II is one of only two such gadgets in operation worldwide. And why a mine shaft, you may wonder? Well, at more than a kilometre below ground and surrounded by solid rock, the delicate equipment is safely shielded from interfering radiation from outer space. It’s all been running for several years now, though I don’t think they’ve found much. The above photograph, taken from the north, shows the sleepy village of Staithes, North Yorkshire. 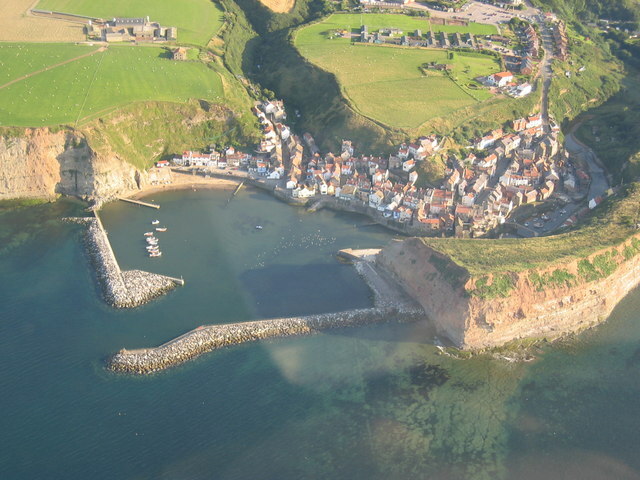 The watercourse, entering the picture from top right, is Roxby (or Staithes) Beck, and is the boundary between the aforementioned county to the left and ‘Redcar and Cleveland’ to the right. In other words, the bulky promontory on right of picture is the very last piece of ‘North-East England’ for the purposes of this blog. It’s known as Cowbar Nab, sheltering, as it does, the tiny hamlet of Cowbar on the ‘North-East side’ of the beck (hidden from view). There is little to trouble the historians hereabouts, though the buildings are old enough (there’s a splendid picture here) – though it seems to have been the site of the local lifeboat station in its various incarnations for nigh on 150 years (and, indeed, still is – see here). Beowulf, that shady mythical figure from Dark Age Scandinavia, has found himself transformed, almost, into a great British hero thanks to that famous Old English poem. Thing is, he wasn’t from these shores – it being likely that the yarn was re-spun by early Anglo-Saxon immigrants to suit their own tastes (and surroundings) in the early days of their ‘invasion’ of our shores. The original is most firmly set in modern-day Denmark and Sweden, yet old historians and antiquarians have persisted in giving the story an English twist. The most stubborn myth concerns the great man’s burial – which followed his death in battle with a dragon. It is said that he was laid to rest by his people, the Geats, in a prominent tumulus on high ground overlooking the sea. Now there is no real reason to suppose that this would have occurred anywhere else other than in the land of the Geats themselves, i.e. southern Sweden. However, more than one ‘expert’ this side of the North Sea has ventured to suggest (principally by fiddling about unconvincingly with place-names) that the spot in question is Boulby Cliff on the Redcar and Cleveland coast. So we’re talking about a mythical hero from Scandinavia being buried several hundred miles away from his homeland on a cliff top in North-East England. Mmm. Mind you, Boulby Cliff certainly measures up at 660ft (the highest sea-cliff on the eastern seaboard), is within spitting distance of the recent Anglo-Saxon Street House Treasure find and is, as it happens, capped by an ancient tumulus. In 2004, excavation work began on one of the most remarkable archaeological finds ever made in England. At Street House Farm, a little to the north-east of Loftus, was unearthed a 7th century burial site containing the remains of an Anglo-Saxon princess. Over the course of the next few years, experts painstakingly retrieved the grave goods and unravelled the story of the site, until the goodies themselves were put on display at Kirkleatham Museum in the spring of 2011. Some of the pieces are associated with a rare – and high status – ‘bed burial’, in which a female body was laid to rest on a wooden bed accompanied by gold jewellery. 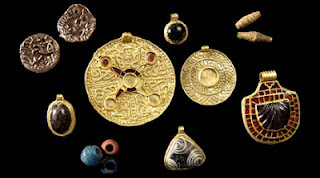 A gold pendant (said to be “unparalleled” in the Anglo-Saxon world), glass beads, pottery, iron knives, belt buckles (among other objects) formed the priceless core of the finds from a site which, in all, included over 100 grave plots. After protracted debate (including mention in the House of Commons), a Heritage Lottery Fund grant of £274,000 helped the local authority/museum in their purchase of the treasure from the Crown, meaning that it could be retained in the region. On 17th February 2003, 40 year-old angler Val Fletcher was casting for little fishes from the beach at Skinningrove. She baited her line with squid and hoped for a nibble – perhaps from a mackerel or something equally as undramatic. She got a bite all right, but it was no tiddler; for it was a 11½ft, 140lb oarfish (aka the King of Herrings) – and it took her a good 40 minutes to reel it in, aided by her partner, the appropriately named Robert Herrings. Though the size of the fish was on the large side, it was a minnow by oarfish standards: they can reach 50ft+. Anyway, the 5ft 4in, eight stone woman beached the monster, dragged it home and left it outside for a couple of days for the locals to gawp at. No one was able to identify the specimen for some time. Oarfish are incredibly rare – especially live specimens. They are the oceans’ longest bony fish, and prefer warmer climes and deeper seas. One hadn’t been caught anywhere in the world since 1996 (off the US coast) – with previous UK finds including two at Whitby in 1759 & 1981 and one off Northumberland in 1794. Val is thought to have been the first person to have landed one with a rod and line. When word finally got round, marine biologists were keen to examine the creature. By then, though, it had already been sliced up into steaks and shoved in Ms Fletcher’s deep freeze. Not many folk have a museum named after them, but Thomas Leonard does. As a consequence – and despite its present-day reincarnation as the ‘Cleveland Ironstone Mining Museum’ – the man’s name is one of the best-known in the region. Tom was born in 1922 at Charltons, a small mining village a few miles to the south-west of the famous museum which now sits betwixt Loftus and Skinningrove. He was schooled in Boosbeck, before beginning his career in the ironstone business at the offices of the South Skelton Mines. He served in the RAF during WWII, resuming his career after hostilities – whilst honing his writing skills at every opportunity along the way. He soon moved into journalism with the Cleveland Standard and then the Evening Gazette, penning many articles – including sports reports. He was heavily involved with The Green Howards for many years, but for a long time nurtured his dream of establishing a museum to the memory of the dying ironstone industry of the area. Indeed, as the mines closed, Tom began collecting various bits and pieces in the hope that he could one day fulfil this ambition. The Gun Room at Gisborough Hall housed his growing collection for many years; then, in the 1970s, the opportunity arose to move the equipment into the old Loftus Mineworks (which themselves had closed in 1958) with a view to opening the collection up to the public. Several years of preparatory work and fundraising saw the new museum open its doors in 1983 – the first (and, I think, only) institution of its kind in the country. Sadly, though, Tom himself had passed away in 1981, and never saw his dream properly fulfilled. The museum was named in his honour – The Tom Leonard Mining Museum – though it has since been rebranded after a radical revamp during 1999-2000. One of the lesser-known and less cared for relics of Cleveland’s history is Kilton Castle, a crumbling spread of masonry clinging to the side of the dene overlooking Kilton Beck a little to the south-west of Loftus. The stronghold, which is now largely enveloped by greenery, was built in the late 12th century on a rocky outcrop overlooking the valley below, being commissioned by the de Kilton family on land leased from the famous de Brus (Bruce) family – and probably preceded by a wooden affair. Immediately thereafter the land thereabouts became more intensely worked, and a sizeable village (Kilton) began developing nearby. Milling was the dominant industry, with records of such activity surviving from the 1320s. By the end of the 14th century, however, the castle and village had been all but abandoned – yes, the Black Death may have had a lot to do with it – and the fortress began its long decline into ruin. Despite occasional attempts at partial restoration, come the 16th century it was long gone and as good as forgotten. In the 18th century another large village estate was built at Kilton, but this was soon dismantled and replaced in the 19th century by a couple of large farmstead estates which remain in use today. Despite being Grade I listed, the old castle receives little in the way of care and attention. The site occupies a fair old area – c.100m x 30m – but after a 1990s survey and preservation plan failed to stir anyone into action, nature began reclaiming the plot again at an alarming rate. More information (and a link to some pictures) can be found here – though there’s not much to see.